Is it a panacea? Absolutely not. Is it a good idea to incorporate turmeric into your diet? Sure, why not! Is it necessary to be a healthy person? No way. Turmeric is the spice that gives curry its yellow hue. (It will also stain everything you know and love yellow. You’ve been warned.) Traditionally, it has been used in India for many generations as a spice and medicinal herb. Turmeric contains powerful compounds called curcuminoids. The most potent and important curcuminoid is curcumin. Curcumin is the most active, medicinally powerful compound in turmeric. Long story short, it’s a very strong antioxidant and it has impressive anti-inflammatory properties. That being said, you don’t get a lot of bang for your buck when it comes to cucrumin and turmeric. The curcumin content only accounts for about 3.14% of pure turmeric powder. Therefore, if you want to experience the full array of benefits, you should consider a supplement that contains significant amounts of curcumin. Yes, that means besides the taste, you likely won’t get a ton of benefit from this latte. You’ll notice that my recipe has coconut oil and black pepper in it. You might find that odd, but it isn’t an accident! Alone, curcumin is poorly absorbed and it needs a little help. Just like curcumin is found in turmeric, piperine is found in black pepper. Piperine has a lot of proven health benefits but the most significant here is its ability to improve the absorption of certain compounds – especially curcumin. Piperine has been shown to increase the bioavailability of curcumin by 2000%. Curcumin is a fat-soluble polyphenolic pigment so it is best absorbed when consumed with fat. I usually use coconut oil or coconut milk if I have that lying around! As a runner, I try to incorporate as many anti-inflammatory foods into my diet as possible. Keeping that in mind, I don’t stress myself out by trying to eat only anti-inflammatory foods. (Even though I accidentally get a lot of them through my diet.) I try to stick to the anti-inflammatory foods that have a lot of research to back them up. A recent study showed that 3 mg of curcumin administered orally (in mice) reduced oxidative stress after downhill running-induced muscle damage. Another study administered 90 mg of curcumin or a placebo 2 hours immediately before and after exercise. Each participant walked or ran for 60 minutes at 65% of their Vo2max. When compared to the placebo, the curcumin supplement reduced exercise-induced oxidative stress by increasing blood antioxidant capacity. Grate fresh turmeric into curries and soups. Roasted veggies – I love curry spiced carrots. Stir some into your favorite hummus. 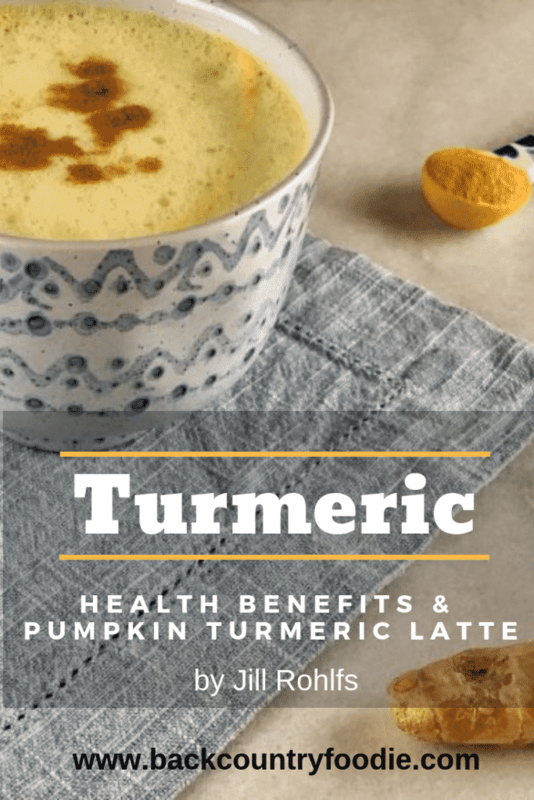 Turmeric latte – See below. Turmeric supplement – But be sure to choose a bioavailable supplement with lots of curcumin! I like this one. You can keep turmeric fresh in the refrigerator for up to a week. Alternatively, you can keep dried turmeric in your pantry. Personally, while I try to have fresh turmeric handy, I often go to dried turmeric or a supplement for convenience. If I’m in a rush, I don’t want to deal with dying my skin and kitchen yellow right before I run out the door! Pro Tip: Pour your turmeric into a container, add some black pepper and mix it around! That way you never forget to add it and you can absorb as much curcumin as possible. Just remember to incorporate a little fat too. First, to a small saucepan, add the plant milk, pumpkin purée, pumpkin spice creamer, ground turmeric, ground ginger, cinnamon stick, coconut oil, black pepper, maple syrup, and vanilla. Next, whisk to combine while warming over medium heat. Do not boil. Heat just until you reach your desired drinking temperature. Be sure to whisk frequently to ensure nothing burns or sticks to the saucepan. Finally, turn off the heat and taste. Adjust to your flavor and sweetness preferences. Serve immediately with your favorite fall themed baked good. * You can skip this ingredient if you don’t have pumpkin spice creamer. This simply intensifies the pumpkin spice flavor and makes it a little creamier. ** You can substitute 1/4 tsp ground cinnamon or pumpkin spice I just really enjoy stirring the cinnamon stick in my latte! *** You can substitute any sweetener you like. I used maple here because it goes well with pumpkin. Jill Rohlfs is a nutrition and dietetics student at Rowan University in New Jersey. We are proud to have her as an intern here at Backcountry Foodie. 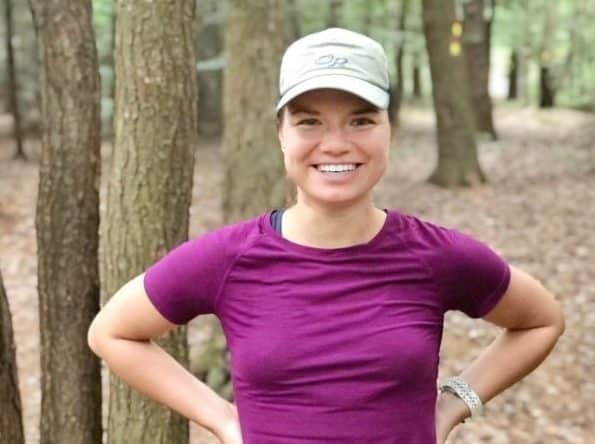 You can learn more about her on her blog Jill Runs on Plants or on Instagram.